« Fuel – the rising cost…. St Martin’s and the Anglican surprise….. I definitely did not start my day thinking that for the first time in my tea totalling life I would take a drink – and definitely not in church!!!! 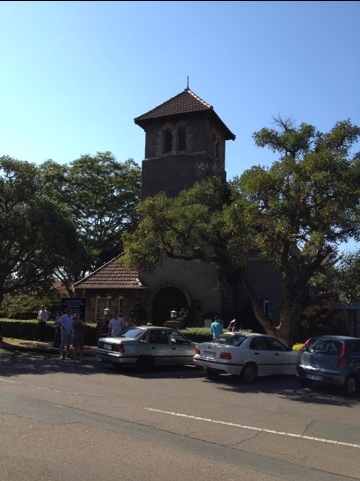 The story unfolds at the 8.30am service at St. Martins Anglican church in Durban North where we joined my brother and his family for church. Sounds really innocent, until they started on communion and a nice lady asked me if I wanted to join in. I mentioned that because of the narrow aisle I would prefer to stay in my wheelchair and they were happy to bring communion to me. Not being Anglican is where things went horribly wrong and after everyone else had finished they brought over the cups, handed me a wafer? – no problem here and then gave me a sip from the cup – wow was I surprised when it hit my lips and before I could say NO, I had swallowed a mouthful of sherry! It hit the back of my throat and nearly bored a hole out the back of my head. I was too surprised to spit it out and my usual prayer of thankfulness turned into something else entirely. Hubby sat there in stunned silence unable to prevent what he only then realised had happened – but boy did we have a laugh about it – after I stopped spluttering and I had eaten a half box of mints! So for any tea-total folks out there who usually have cranberry or grape juice at communion – watch out for those Anglicans, they use the real deal! That memory is a definite keeper.